MR. HEALY: Sir, you will recall when I made an opening statement last week I mentioned that the Tribunal proposed, as part of the revisiting of the some of the areas already mentioned, to go back to the Leader’s Allowance Account and in particular the connection between funds raised for the purpose of discharging the medical expenses of the late Mr. Brian Lenihan and lodgments to or withdrawals from the Leaders Allowance Account. Now, this matter was mentioned in the course of an opening statement in July of 1999. 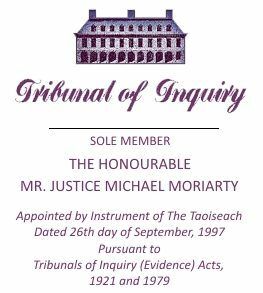 It was subsequently mentioned once again in October of 1999 and you recall, Sir, that between July, when the matter was mentioned in evidence at the Tribunal sittings, and October, Mr. Haughey made a public statement and as a result of that public statement, a copy which was made available to the Tribunal, the Tribunal carried out some further inquiries and those inquiries resulted in evidence which was led in October concerning the manner in which funds raised for Mr. Lenihan were applied, either to the account or to the discharge of his medical expenses. Now, since that date, some further information has become available to the Tribunal. Firstly, Dr. Eamon De Valera has approached the Tribunal with information he felt would be relevant to the Tribunal’s Terms of Reference in the context of that evidence concerning a contribution he was requested to make to that fund. Dr. De Valera will give evidence concerning the request to him for a contribution from the Irish Press, the decision the Irish Press made to make that contribution and the manner in which the contribution was made. You will hear that the contribution was made through the Irish Press accountants, I think who were then called Coopers & Lybrand, now called Price Waterhouse Coopers, and Mr. Dan McGing, the then Irish Press connection with Coopers & Lybrand but now a person who has severed his connection with Coopers & Lybrand, will give evidence in relation to the manner in which the payment was treated. The Tribunal has also received information concerning contributions made to that fund by other individuals. Most of the additional information which has become available to the Tribunal concerning the way in which the fund was operated initially came from Mr. Paul Kavanagh. Now, you will recall that Mr. Kavanagh gave evidence to the Tribunal in October of 1999 concerning the efforts he made to raise funds to defray Mr. Lenihan’s medical expenses. In that evidence, he mentioned that he was approached by Mr. Haughey who described, if I can put it shortly, the problem that was to be addressed concerning Mr. Lenihan’s medical expenses, and he described the efforts he made to raise funds for that purpose. He mentioned that he had at least one initial meeting with Mr. Haughey and that he then put together a fund raising enterprise involving mainly himself and Mr. Peter Hanley. They approached various individuals between sometime in early May of 1989 and the end of the 1989 election, which would have been in or about the 16th June 1989. Mr. Kavanagh has since made available to the Tribunal a document which he came across in, I think, recent weeks, in the course of examining some documents in his own offices. That document, which he made available to the Tribunal, is on Irish Printers Holdings Limited notepaper, which is the company of which Mr. Kavanagh is or was managing director and is a document which he put together at the time of the fund raising initiative containing the names of a number of individuals intended to be approached in connection with the fund. It also contains an amount of information which seems to suggest that certain sums of money were either collected from or likely to be collected from certain individuals. Mr. Kavanagh has informed the Tribunal that the list of names on the document were, with the exception of one man there, Leo Caffola, a list of supporters of Fianna Fail and he thinks that the manuscript list of names on the right-hand side of the document in his handwriting is a record of what he expected to raise as opposed to what he did raise from the individuals concerned. Now, the Tribunal has made contact with some of the individuals on this list and has established that certainly some of the names mentioned on the list as having made or as likely to make contributions did in fact make contributions to the fund. In order to put the evidence that is going to be given concerning additional contributions to the fund in context, I should remind you, Sir, that the evidence to date suggests that the total of the debits to the Leader’s Allowance Fund for the expenses of Mr. Brian Lenihan’s medical care were £83,197.56. Those debits were made to the fund between the 22nd June 1989 and the 13th February 1991. You will recall that, in addition, evidence was given that the VHI made a special grant toward Mr. Lenihan’s medical expenses in the sum of £57,247.49. Now, at the time that this matter was last dealt with in the course of the Tribunal sittings, evidence was given that there were substantial lodgments to the Leader’s Allowance Fund in or around the period mentioned by Mr. Kavanagh as having been the period during which the funds were raised by him for Mr. Lenihan, that is to say in or around May or June of 1989. What the Tribunal’s other inquiries at that time suggested was that, in the year 1989, the excess of funds in the Leader’s Allowance account over and above the payment from Central Funds towards the Leader of the party was £220,000. Evidence was also given that the only payments into that account in the main in any case, were the actual, I think it is monthly or bi-monthly, payments from the Exchequer to the Leader’s Allowance, together with the funds lodged in connection with Mr. Lenihan’s medical expenses. What the Tribunal is anxious to establish is whether the additional funds or the additional information which has now become available from Dr. De Valera, that a payment of £10,000 was made by the Irish Press, enables the Tribunal to decide or ultimately to conclude whether that £10,000 forms part of the £220,000 excess in the Leader’s Allowance account for that year; whether a further sum of £20,000 contributed by Mr. Seamus Tully also forms part of that excess; whether another sum of £20,000 made available by Mr. John Magnier also forms part of that excess; and whether a sum of £10,000 which appears to be contributed by Mr. Nicholas Fitzpatrick through a company he operated called Atron also forms part of that excess. Those additional sums which have come to the attention of the Tribunal amount to £60,000. There is, of course, the further question whether, if those funds went into the Leader’s Allowance account and formed part of the £220,000 excess, how they were ultimately disposed of, bearing in mind that only £83,000 odd went out of the account towards defraying Mr. Lenihan’s medical expenses. The question is where they went and what use they were put to, having regard to the use for which they were intended. There are a number of subsidiary matters which arise from the list brought to the Tribunal’s attention by Mr. Kavanagh of which one is the fact that the list refers to Dr. Edmund Farrell as being debited with a payment or a sum, either an intended sum or a received sum, it’s not clear from the list, of £40,000 and you see that opposite Dr. Farrell’s name on the printed list is £40,000 and opposite the name on the manuscript list is the number 40. Dr. Farrell has told the Tribunal he did not contribute, either through himself or the Irish Permanent Building Society, the sum of £40,000. Mr. Magnier, whom I mentioned a moment ago, has confirmed that he made a payment of £20,000 and Mr. Tully has likewise confirmed that he made a payment of £20,000. There are other names on the list. Mr. Fitzpatrick has confirmed that the reference to Atron is a reference to a company that he controlled by whom the sum of £10,000 is contributed. Neither Mr. Barry nor Mr. McManus were in fact, according to the information they made available to the Tribunal, approached in connection with the making of any payment. The Tribunal has not been able to complete its inquiries in relation to some of the other names on the list and has not been able to identify all of the names on the manuscript list. Now the list also, if you go to the top right-hand corner of the list, contains two figures of 200 and 175. Whether it’s a reference to pounds or thousands of pounds is not clear, but having regard to the rest of the list, it probably refers to thousands. Mr. Kavanagh has informed the Tribunal that he does not know what the figures signify but that he thinks that the figure of 175 should be a figure of 135. But you will recall that evidence was given by Mr. Kavanagh on an earlier occasion, that his target figure at the time was between £150,000 and £200,000 and the Tribunal will wish to pursue whether those two figures of 175, as it seems the figure in a circle is, or 200 were in fact the target figures mentioned in the course of the discussion with Mr. Haughey which led to the setting up of the fund. Thank you.